TCOM will call you the day before your surgery between 2pm and 4pm to give you your surgery time. TCOM may call you sooner if the schedule is available. If your surgery is on a Monday, TCOM will call the Friday before. The SurgiCenter is closed on weekends and holidays. If you do not hear from us, please call TCOM at (309) 662-6120, press option 7 or (800) 466-8275, press option 7. It is extremely important to follow the instructions you are given or your surgery may be cancelled. If you are receiving sedation, you will need a responsible adult (age 18 or older) to drive you home and stay with you for 24 hours after surgery. Should the responsible adult wish to leave the waiting room, the receptionist will obtain a phone number where they can be reached. However, they should be encouraged to stay at the SurgiCenter to speak with the physician, be available for more information, or be available to accompany patient upon discharge. Any patient under the age of 18 shall have a responsible adult remain in the surgery center at all times. If you are not receiving sedation, but are having an injection in your spine or one of your lower extremities, you will need someone to drive you home due to the possibility of having numbness or weakness in your lower extremities. 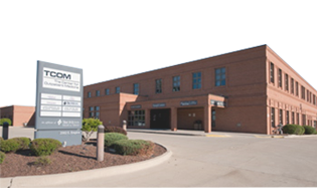 At The Center for Outpatient Medicine, we are dedicated to providing the highest quality of care. Your comfort, well-being and return to normal activity are our primary concerns. All patients having surgery at The Center for Outpatient Medicine will receive a post-operative follow-up call from a nurse and a patient satisfaction survey several days after their surgery. We welcome your comments. These comments assist us in providing you the highest quality surgical care available at the lowest possible cost. If you are not receiving sedation, you may eat a light breakfast or lunch. If you develop a cold, flu, fever, or have any cuts, sores or abrasions at operative site please notify TCOM nursing staff immediately upon arrival. Depending on your surgery, you will be instructed to arrive 1 – 1 ½ hours before surgery. Same day surgery patients must have someone to drive them home. You must also have a responsible person to stay with you the rest of the day of surgery and also during the night. You should not drive a car for 24 hours following your surgery. It is not acceptable to take a taxi home. If you have children, please make arrangements for their care. A health care facility is not an appropriate place for children. A waiting area is provided for the family member or friend accompanying you. Two persons may wait with you prior to your surgery and during the post-operative time. A child having surgery may have both parents with him/her during this time. You will be instructed on diet and drinking restrictions when you call for your surgery time. Do not take your morning medication unless your surgeon or anesthesiologist has instructed you to do so. In that case, take them with sips of water only. If you develop a cold, flu, fever, or have any cuts, sores or abrasions at operative site please notify TCOM nursing staff immediately. Remove all nail polish from fingers and toes. You should wear glasses instead of contacts. Do not drink any alcoholic beverages for 24 hours before or after your surgery. You should wear comfortable clothes, something easy to get on and off your operative area. Do not bring money or jewelry. Do not wear make-up, particularly mascara the morning of your surgery. You should shower or bathe the evening before or the morning of surgery with an antibacterial soap (for example, dial or safeguard). You may bring loose fitting shorts to wear under the patient gown if appropriate, provided they have no metal (buttons or zippers). Please re-read these instructions prior to the day of your surgery. Please understand that if you do not follow the instructions or if your physical condition changes, your surgery may be cancelled. Also understand that if you are sick (fever, cold, flu, or infection) the day before or the morning of surgery, you are to call TCOM nursing staff at (309) 662-6120, press option 7. If you are having specific orthopedic or podiatric procedures, then your surgeon may order a nerve block before or after you surgery to limit pain in the post-operative period. While it may not be 100 % effective, it can greatly lessen post-operative pain. Your anesthesiologist will use a nerve stimulator to locate the appropriate nerve and will then inject numbing medicine. You will have light sedation during the block procedure. Your surgeon and/or anesthesiologist will explain this again in more detail on the day of your surgery. Your surgeon, anesthesiologist, and TCOM staff will be available to answer any questions.